The County Showground at Detling, in Kent, could be used as a giant lorry park when there are delays at the Channel ports, it has emerged. Kent Police and the Highways Agency have been looking at Operation Stack, where lorries park on the M20. But Geoff Cosgrove, chairman of the parish council in Detling, said it was a "madcap scheme" and the traffic was already bad enough in the area. 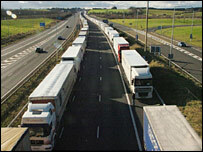 The Highways Agency said using land for lorries was just one of several ideas. When Operation Stack is enforced upwards of 1,000 lorries regularly cause delays and disruptions to other motorists. However, it avoids congestion in Dover at times when the port is not operating normally. Mr Cosgrove said the scheme would cause further chaos and mayhem to the village, where the main A249 road was already very dangerous, and had no footpaths or lighting. "Surely they would have to upgrade it to trunk road status, which would cost millions," he said. "It's just a madcap scheme to introduce all those lorries, unfamiliar with the local area, into the local infrastructure." A statement from the Highways Agency said: "There are no new changes, there are no new decisions, we are just looking at helping to find a solution. "The Highways Agency is working with a number of agencies to help find a long-term solution to Operation Stack. "Using land to park lorries off the highway is just one of a range of ideas that have been put forward. "These will need to be discussed in more detail and it is too early to say at this stage what might emerge as a solid proposal."